Hey y'all! Earlier last week I posted over on my Instagram about using Unique Learning in my classroom, trying to figure out a doable schedule, and choosing which activities are worth my time and which are just not a great fit. If you have ULS, you know that it is VERY overwhelming with an insane amount of materials and information. Let me just preface this with: I am NO expert on ULS. I have no idea what I'm doing half the time (honestly) but I've been trying to find a good groove this year and here is what I've got so far! 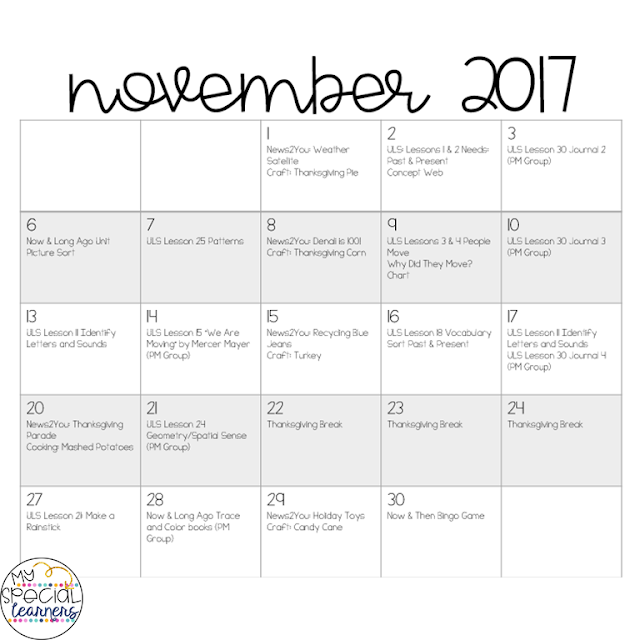 So as November began, I sat down with a glass of wine and started digging through all of the November lessons. This month is all about People Long Ago, which is great for November and adding in some Now vs. Long Ago work! There are certain lessons I ALWAYS do (the comprehension ones for 1-4 and the vocabulary sorts always happen!). There are certain lessons that I HATE (that might be a strong word but there are a few lessons on the Elementary level that I truly do not like at all). 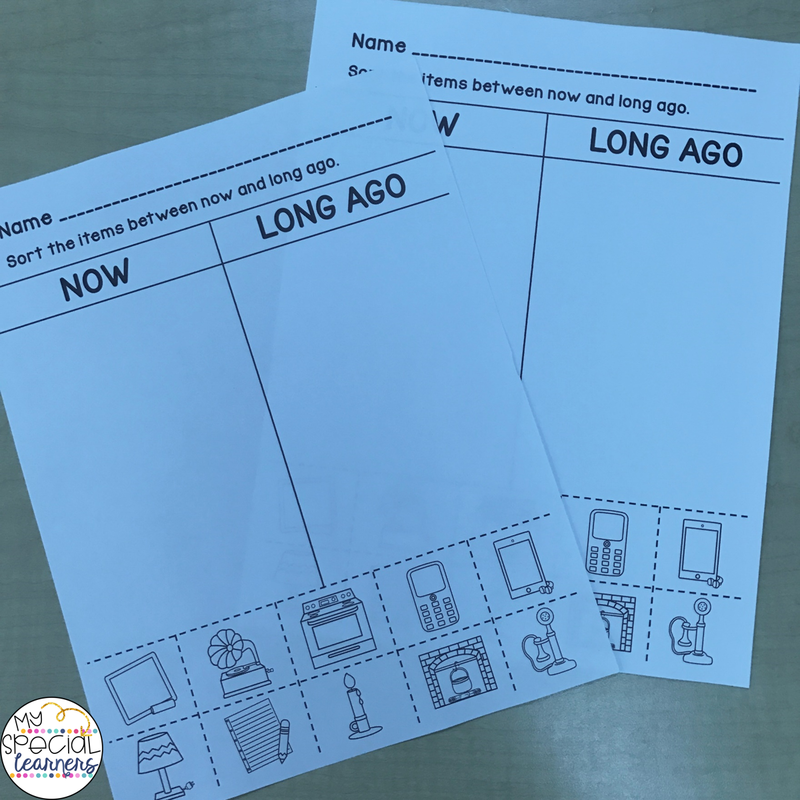 Some of the lessons I never use are the telling time, the "history" lesson (which is always a timeline and basically just ordering numbers in numerical order), the scrambled sentences, and a few others. Again, these things are just MY personal preference, and obviously things change with different groups of students! I started by emptying out this tub (ignore the tabs, those are all wrong and I still need to update them!). Inside the tub I put all of the printed materials in order from beginning of the month until the end of the month. Once I get around to changing the tabs, they are going to have the days of the week on them to go along with my monthly plans calendar! I assigned 1-2 activities to each day of the month and do most of them in whole group format this year. This lesson (lessons 3 & 4) is a must-do this month. 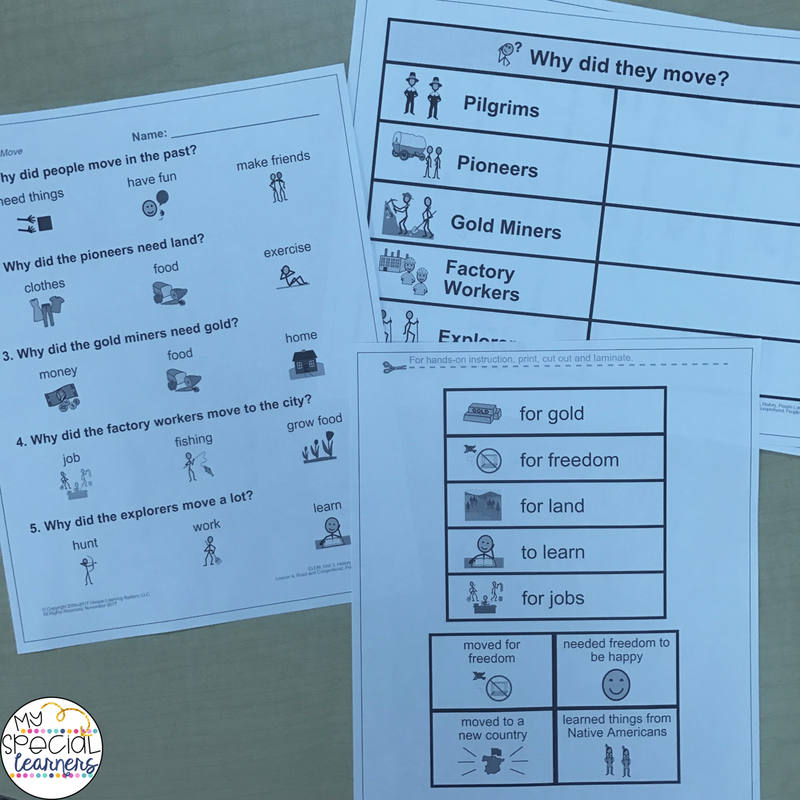 It is a great way to work on comprehension but also adds in some History standards to cover those bases with my kiddos! The other comprehension lessons (lesson 1 & 2) are always another "must do" with my students. I love that they differentiate the comprehension questions page (3 levels: 1 with just words, 1 that you see above with pictures, and another that has pictures but only 1 question per page). It provides easy differentiation when you need it! 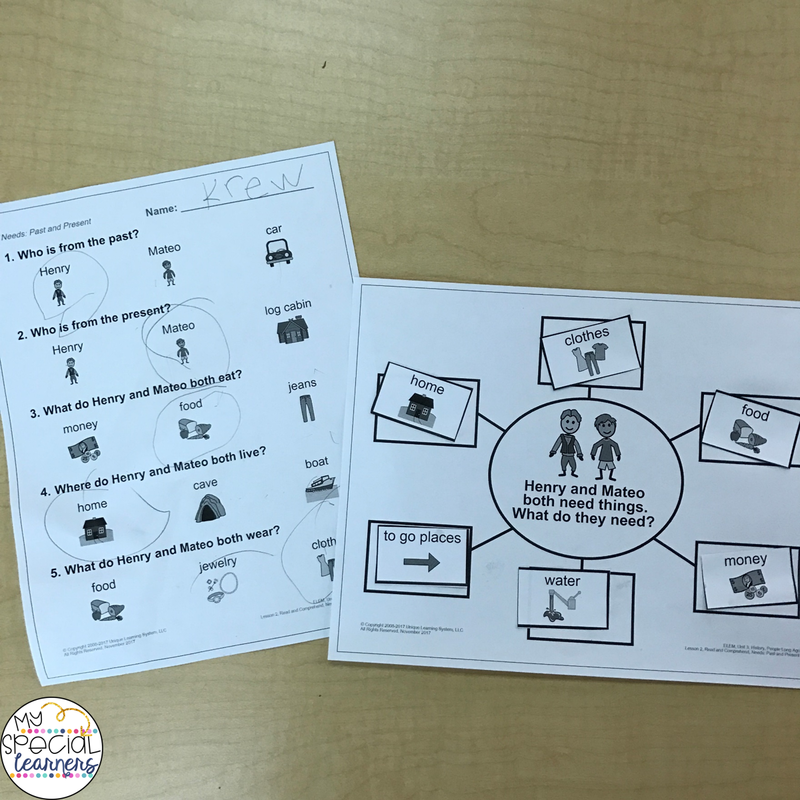 We also did the additional materials that went along with this lesson which was awesome because there were no wrong answers for the "needs" web! 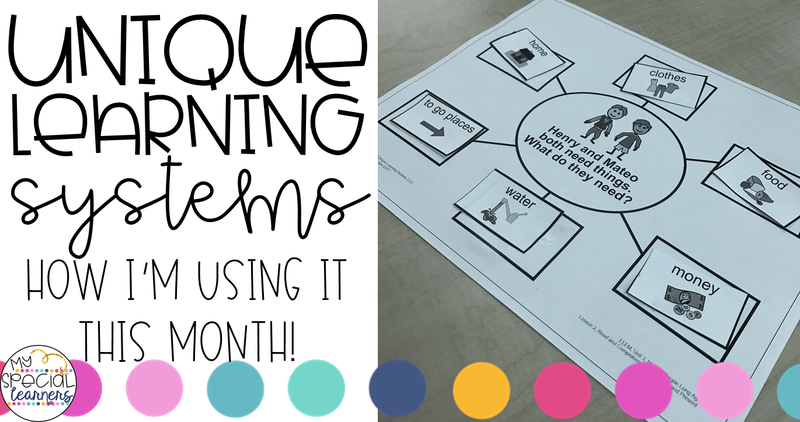 This vocabulary sort lesson is another lesson I always do with my students! It's a great way to practice the material we are working on while also working on sorting, cutting, gluing, etc.! This now & long ago sort is another activity we are using this month (it is a part of my Now and Then Activities Unit) along with some now & long ago bingo! 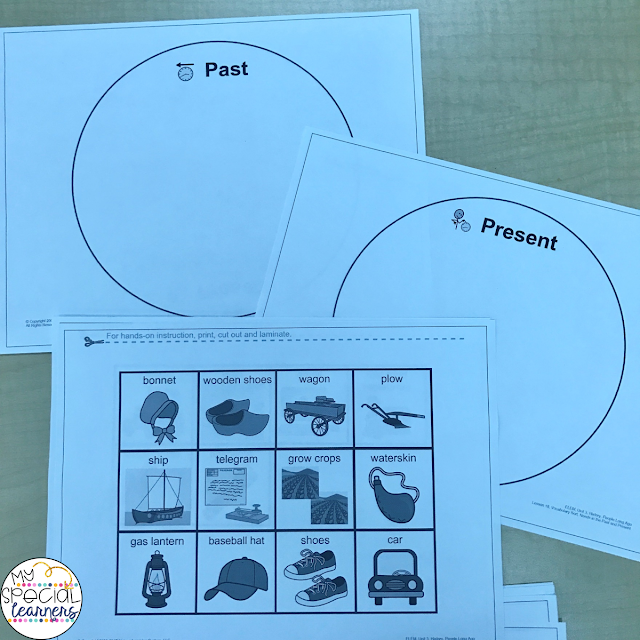 This will be a great way to practice sorting those items that we are learning about from the past and the present and to check for my student's understanding. These are also the crafts we are doing in the coming weeks (you'll see them on my calendar!) and they are all from Gabrielle over at Teaching Special Thinkers. I LOVE her Easy Art Crafts! We also have a subscription to News2You, which I LOVE, and we do that once a week during our whole group time. If you don't have News2You, I would definitely look into it! 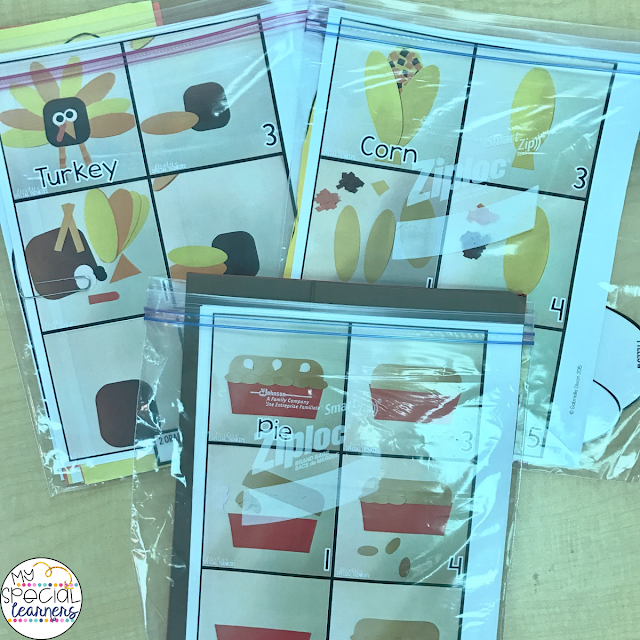 It's cheaper than ULS and has a tons of worksheets that go along with the weekly paper which is awesome! Obviously we are doing more than what was pictured above from this month's ULS, so take a peek at my monthly calendar up above to see which lessons we are hitting this month! I might not use all the same lessons next month, as it depends on the content, but hopefully this gives you a good idea of how I'm using it for now! I feel like I could go on for days about different things inside ULS and would love to hear what some of your challenges, strengths, and favorite parts are! How do YOU use this in your classroom?! This is awesome! I have ULS and N2Y but can get so overwhelmed by it. Do you have a daily schedule you can post? I'd love to see how you utilize this into your day! I honestly only do ULS or N2Y once per day. I have a whole group time in the mornings now where I do the scheduled activity for that day (like what you see on the November calendar above!). We always do it at 10:30 until the lesson is complete! In the past, I've done centers when I could do more of the activities with my kiddos so we would rotate 3 different stations and my aides would each run one as well! 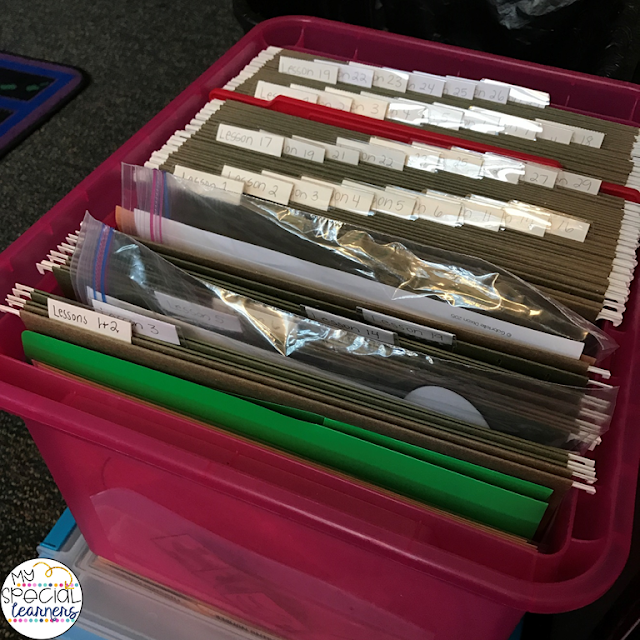 I totally agree about the first few lessons - the two stories and all the comprehension pages and sorting activities are amazing ! I also almost always do the graphing as a whole group activity and usually the extra reading comprehension -this month it’s the Freight Trains book with the visuals. I sometimes do the journals but my students do other things so it isn’t always necessary. I wish I used the math more but it’s completely overwhelming to me and there is no way I have time to print, cut and laminate all those manipulative so I just haven’t figured out how to use that more. I do a similar thing in my classroom with a monthly calendar and try to figure out each month which lessons I am going to use ! I am always looking to see how other teachers use ULS but there’s not a whole lot of information out there !! Thanks for sharing ! Yes! I don't love the math stuff, I just feel like I personally have a way better stock of math materials that I can use at other times throughout the day! This is very helpful! Would there be any way you could link your calendar so it is printable ? Thanks so much! ULS can be very stressful and overwhelming especially with 0 training on it... Do you utilize the word wall? I teach Elementary k-4 Multiple Disabilites and I am not sure if it would be beneficial. I have used the word wall in the past and used the words as spelling words, but that was when I had K-5 students (so I did that with my older ones!). I just don't find it very beneficial with my K/1 kiddos right now! I am at the middle school level and I have a class of 12 self-contained mild/moderate kiddo. This is my 5th year using Unique, and I love it. It IS a beast of a program, though, with a ton of stuff. First of all, ULS publishes a "suggested monthly guide" in the teacher materials and so that is always where I start when planning lessons. I use the reading materials (for us it is 6 chapters of a book each month). I often don't finish before the month ends. I use many of the lifeskills presented between those lessons. I use the vocabulary words as spelling words. I also add in calendar skills, Accelerated Reader, and a journal topic of my own choosing. I like the math less, but I use a lot of it. I download the PDF in Acrobat Reader and will print 2 or 4 pages to one sheet of paper. There is a ton of stuff and I run myself a little bit crazy trying to keep up. Sometimes I just have them answer on white boards and save myself the printing. I also use Touch Math and Touch Money, which I think are valuable. We also have News2You and I use that for my "social studies" I alternate reading at different levels during the week and do the extension activity on Fridays. I also show Channel One News in my room daily as part of social studies. At one time I used some of the N2Y worksheets as a homework packet, but we are limited now on papers and copies, so, bye-bye homework! We try to cook weekly, and I often use the recipe that is found in N2Y. For science, I use books from the N2Y library. In the middle school curriculum, there are suggested titles each month under the Monthly Lessons for Science, and I pick and choose from among those. Sometimes I supplement with youtube videos. This was super helpful. Thank you. This is my first year using ULS and it has been overwhelming. Thanks for your insights! How did you print all of the materials for ULS? I got it last year and was so overwhelmed that I did not use it. I would love to do what you suggest, but our printing is so limited at my school and I only have the subscription for a few months after the new school year.